A photoblog with an emphasis on desert photography. Thanks for visiting! In my neck of the woods, yes, the weather has been crazy. But not unpredictable. I recall reading multiple predictions about weather becoming more extreme... expect winters to be colder, summers hotter, storms more intense, droughts more prolonged. LA's average high temps in February were the coldest on record since the 60's, and the longest stretch of consecutive days without hitting 70. By extrapolation, these weather extremes mean wildfires will be worse as well as flooding during intense thunderstorms. Blame it on global warming. If you don't believe in global warming, blame it on whatever you want to blame it on. 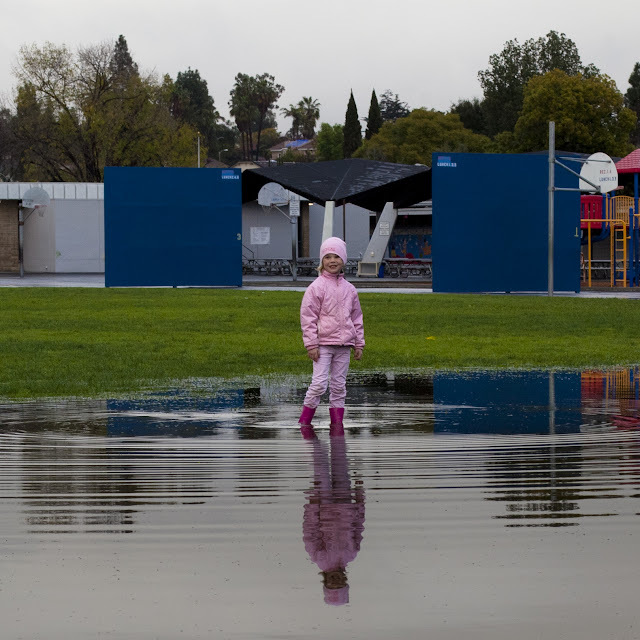 The good news is that the drought in Southern California is officially over after more than seven years. Call me a cynic, but I'm willing to bet it will be back! 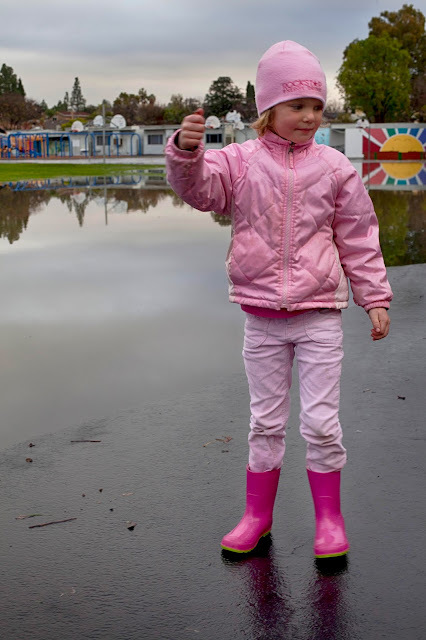 One result of crazy weather was this new pond in our neighborhood that sprung up out of nowhere over at my granddaughter's elementary school. All it took was a few hours of intense thunderstorms, and presto, instant pond! It's covering part of the blacktop on her playground as well as part of the soccer field. Within a couple hours of being formed, our new pond came complete with two ducks! I saw no fish. I guess all kids like to play with worms, and whatever other critters they might come across. Granddaughter Lilly is no exception. By the next day, things were back to "normal" and the pond was gone (does normal even exist anymore?). The tree in our front yard has been in full bloom. Grass is green and skies are blue over at the local park, just the way they are supposed to be! 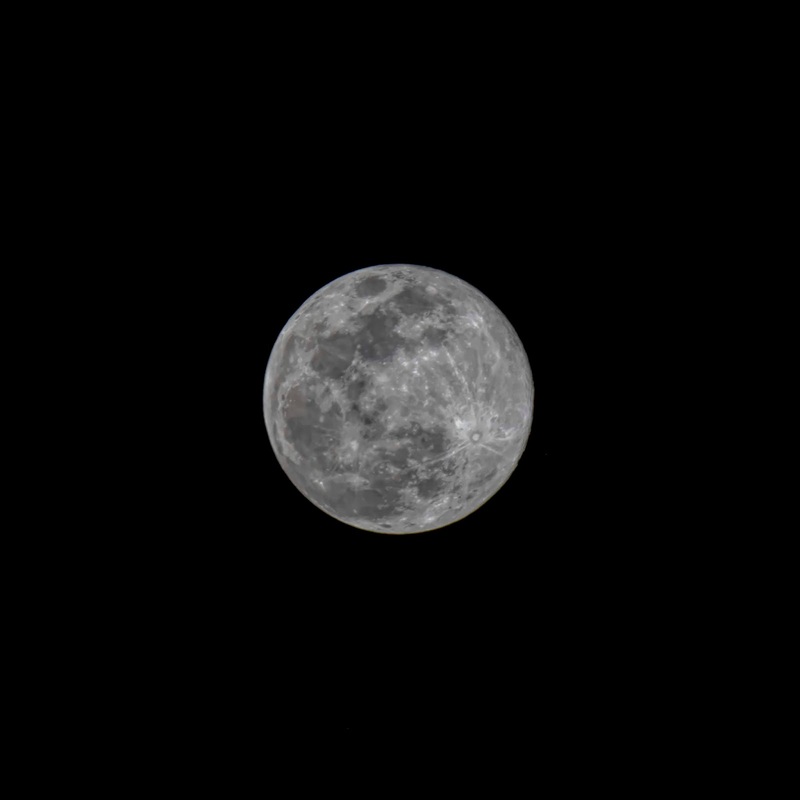 And I couldn't resist a shot of last night's spring equinox supermoon. We have to wait until 2030 before this happens again! I liked Lilly and her boots the best. A cold winter was predicted here, but I had no idea we would get so much rain and snow. Over 10 inches in town, I just read in our local paper. There's a lake here, on the way to town, that appears after heavy rains. I only saw it once, but I will pay attention next time I go to town. It even has a name, Proctor Lake. Your moon shot is a beauty. 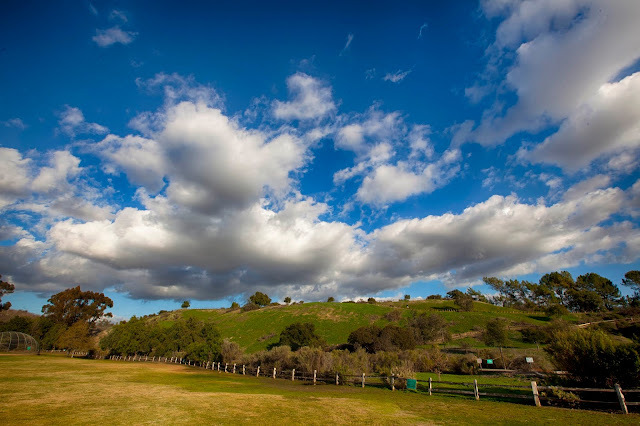 Green grass, billowy white clouds...who could ask for more? Lilly's having fun in her pond! I'm guessing the pond is not gonna be there soon. Love the moon shot. Whenever it rains, the high school I occasionally work at has to cancel doing anything PE in the field for a couple days. Soggy and muddy, along with the "ponds". Did you guys get hail, too? 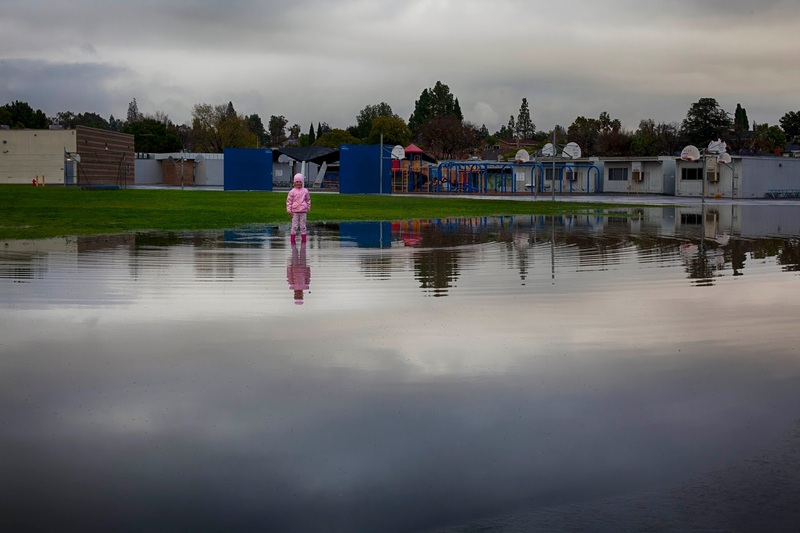 California seems to have extremes of weather, terrible droughts and rainstorms. I remember years ago reading about hillside homes sliding down because the ground had become unstable due to heavy rains. You have a very cute granddaughter. Water and children go hand in hand. I just observed the school children running through puddles of water from the snow melt.Not all feet stayed dry,I'm sure. Love the blossoms and the cloud studded blue sky. Hello, the weather does seem to be extreme. I am a believer in climate change. Your granddaughter is so cute. I love the view of the sky and park. Your moon photo is beautiful. Enjoy your day, have a great weekend! Super photos of your gorgeous granddaughter. Yes we are having hotter summers and wilder storms. We went for more than 40 days with 30+°C. Different from your normal more dry shoots but something to remember. Wow, that's a long drought. I love Lilly's reflection in the new pond. I aspire to take photos as beautiful as yours. Great post. The weather is definitely not normal any more. It is rather scary just how wild it has become and so quickly too from one extreme to another. I enjoy your photos. Loved your granddaughter and Super moon pic, Awesome. Children and ducks can be relied upon to find water wherever it occurs. Lovely photos, particularly those of your granddaughter. Instant pond with two ducks, sounds like something you can buy. :) I love your moon shot, very nice indeed. Gorgeous captures all! Strange to see ducks in the pond so soon after the pond formation! That pond looks like great fun for the kids! Nice shots. I agree the weather does seems to be extreme these days. Ducks and kids love water. As a kid I dare pick up a worm but no more as I grow older. Beautiful photos of Lily, flowers, park and the moon. Climate change has effects all around the world, Peter. This is very worrying for our grandchildren. Your photos of Lilly are wonderful again. I hope see can see the location of that image above the moon this beautiful when she has our age. Interesting post....climate change is here but to what extent is man responsible? 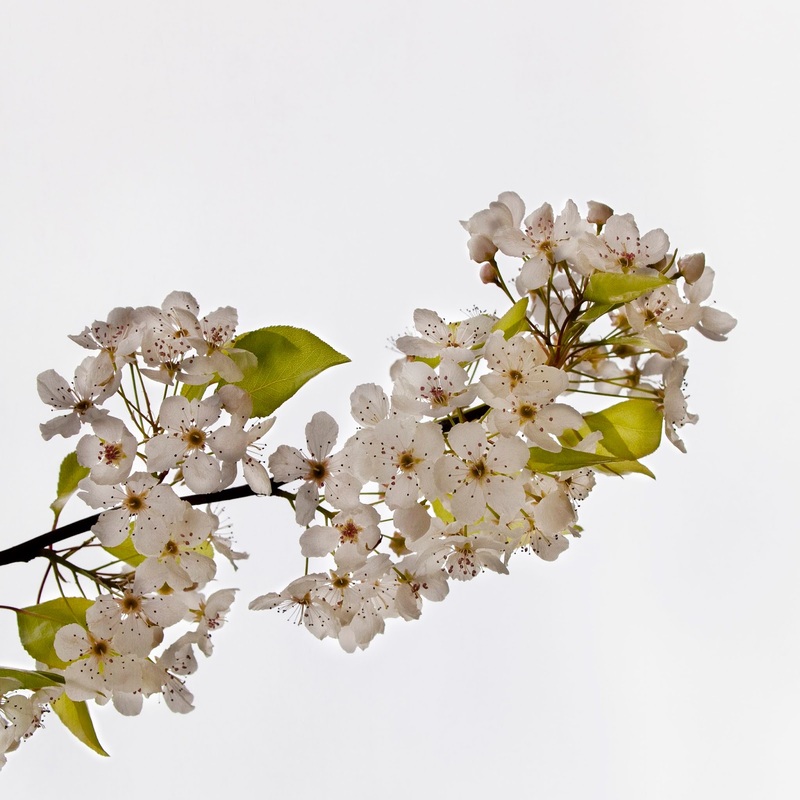 Such beautiful springy pictures! Interesting post too! 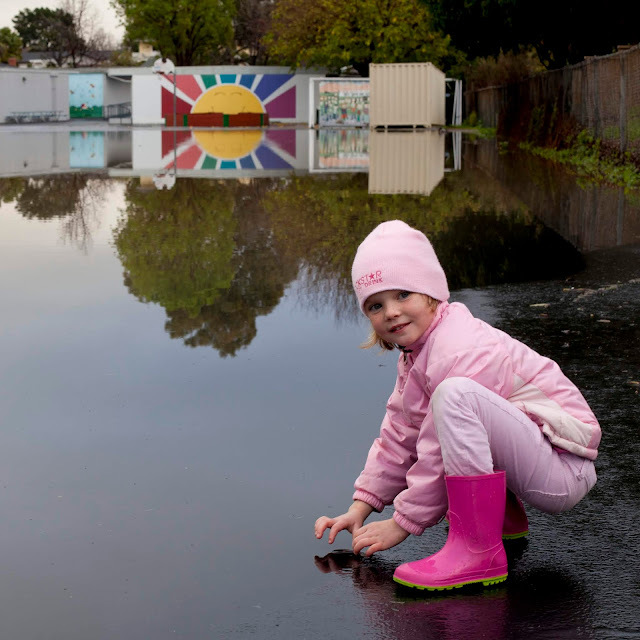 My grand daughter who 3 loves the puddle. We won't have anything blooming for I would guess a good four weeks. Here in Bergen, too, we have got wetter and milder winters and even drought in the summer. I worry about climate change every day. We have over 30 eagles here in the area, and quite a few are marked. Some are very eager .. Have a nice weekend! Well she seems to be greatly enjoying it! As for the supermoon we didn't get to see it here, as usual too cloudy. sigh. Great reflections. Lilly looks pretty in pink! Oh your grand daughter looked so happy playing in the "lake" - too bad it has been swallowed up by the ground:( by the way, she is getting taller, and pretty! Yes, I like the grass to look green and the sky blue - so restful to the eye. Don't know what next week will bring, but enjoy it! Memories of my son (who's in his late 20's now) playing in puddles when he was young. Amazing how wildlife finds these ponds so soon after they are formed. It's just temporary (I hope?). Lovely blooming tree - nothing where I live, yet,but it's spring in suburban New York City, where I am right now, so maybe in another week or so? Enjoyed your superbloom pictures below, too. Weather to me is cyclical and will change from time to time----I blame no one. Your grand daughter is a charmer. What perks does your gorgeous model get? Your granddaughter looks pretty cute and has the name of my mom – Lilly. 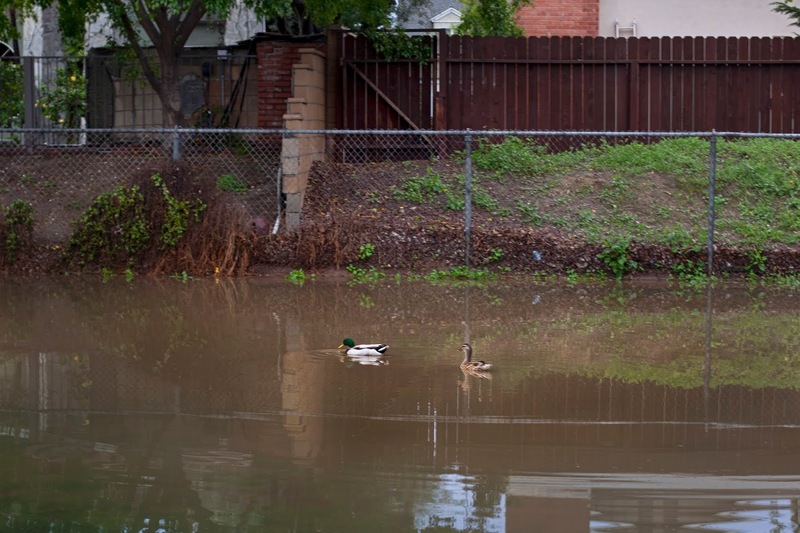 I too in childhood had played with after shower critters… and cool to see the ducks took to swim in the instant pool. You capture everything out there lovely and the super moon was celestial! In the long-distance shot of Lily by the "pond", I imagined her a bit forlorn and bewildered by the sudden arrival of this water feature. But your close-ups show a different story … I never met a kid that didn't like a good splash around in a puddle. Although her pink outfit looks a little too nice to be playing with worms!!!! Lovely Lilly! I love the moon photo too. Magnifique travail de pro. Tes sujets sont bons, la composition dans le cadre,au top, la lumière maitrisée. Beaucoup d'émotion ressentie en regardant tes photos. Amitiés envoyées depuis la France..
That’s wild how those ducks found that temporary pond so quickly! Expect they were surprised when it disappeared just as quick. I do not like the “new normal” one bit. Climate- or any-other-wise. I have a wonderful wife, two grown children (young man and a young lady), a granddaughter, and lot's of hobbies, some I hope to blog about! I'm recently retired and loving the extra time and freedom that comes with retirement! We split our time between Orange County, CA and the Joshua Tree area. Interested in purchasing one of my photos?? Click on an image below to find out more!! Copyright applies to all content and photos. Watermark theme. Powered by Blogger.